Chronic facial pain etiologies characterized by constant and unrelenting pain are often classified as trigeminal neuropathic pain or trigeminal deafferentation pain. These terms are frequently applied to a large number of facial pain syndromes that do not fall within the description of classic trigeminal neuralgia (TN). These “atypical” etiologies can be refractory to a number of pharmacological and surgical treatments. Intracranial neurostimulation therapies, such as deep brain stimulation (DBS) and motor cortex stimulation (MCS), can be utilized in an attempt to alleviate disabling pain conditions. 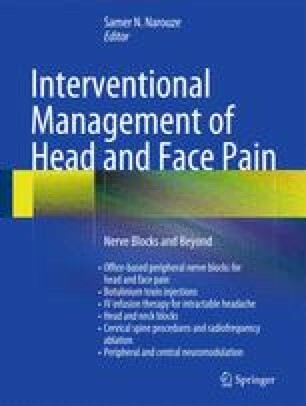 This chapter provides a brief history of DBS and MCS for treating facial pain, along with a summary of surgical procedures, potential mechanisms of action, and clinical outcomes.